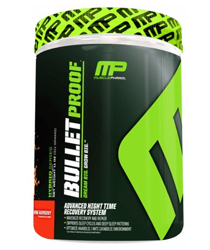 I recently ordered the supplement “Bullet Proof” by Muscle Pharm, and I thought I would post a review here at the blog for anyone who might be interested in purchasing it. 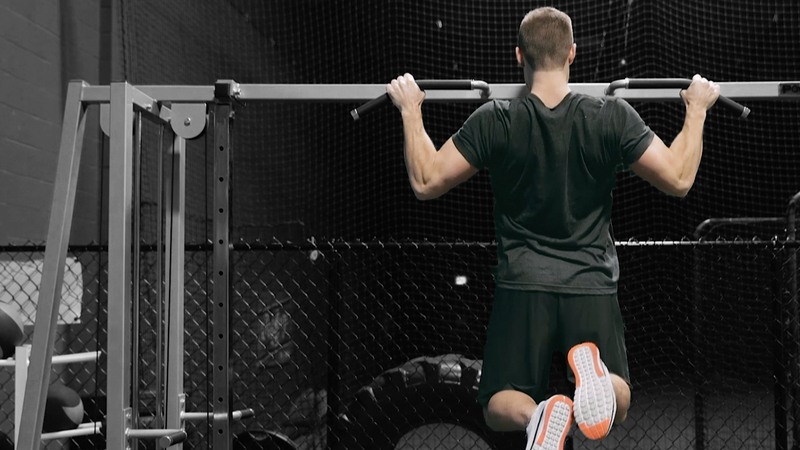 Muscle Pharm describes this supplement as a nighttime recovery matrix made for athletes or people who are working out and want to help their muscles recover and sleep better at night. Bullet Proof as a formula that was designed to enhance deep sleep and maximize recovery and repair of the muscles, contains anti-inflammatory and imune boosting agents for cellular protection, and contains a proprietary blend of amino acids (which we know are good for multiple functions including recovery and muscle building). This supplement is to be taken with 8-12 oz of water 30-45 minutes before bed time. You are also supposed to cycle on for 5 days and then off for 2 days. Basically I ordered the Bullet Proof supplement to take before bed and help me get into a deeper sleep and repair my body/muscles over night, as I wanted to train hard without being sore the next day. There are products out there that help with getting you into a deeper REM sleep (such as ZMA), and there are supplements that help your muscles repair themselves (BCAAs), but this was an all-in-one supplement so I decided to give it a try. Muscle Pharm also usually comes out with some great, quality products so I thought this may be another that my body would respond well to. So how did I like Bullet Proof? I would rate it a 6/10. I’m not sure if it was just my bodies reaction to the supplement, but I didn’t like it at all. The first problem before anything was the awful taste. I bought Orange Raspberry and it pretty much tasted like chemicals. I’m not one that enjoys having to chug something down that doesn’t at least taste OK, and especially before bed. So for a review of the taste I would give it maybe a 3 out of 10. Another problem is that chugging 8-12 oz right before bed always causes me to wake up in the middle of the night. I usually try to taper off my water intake close to when I’m heading to bed, but that is unavoidable with this supplement. Now onto a review of the effectiveness. Because of the ingredients within the product I think it is pretty effective when you are sleeping, but the problem for me was I found that I had troubles falling asleep after taking this. One possible reason is that it includes beta-alanine within one of the blends, which causes some tingling in you body if you take enough of it. My body is adapted to beta-alanine because I take it everyday, but I felt like I was getting itchy after taking Bullet Proof. There is also L-Tyrosine within the Night Growth Matrix, which may also be why I had troubles falling asleep. Whatever ingredient it was, the fact was I had troubles actually falling asleep when taking Bullet Proof. Once I got asleep I believe I did get into deeper sleeps, and the product was effective thought. Overall I give it a 6.5 out of 10 for this Bullet Proof review. The price is reasonable, but I wouldn’t be purchasing this product again. I would recommend you take that money and purchase a ZMA product and a BCAA product, and just take the two together before bed making your own “nighttime growth matrix”. It may not be as quality of ingredients as Bullet Proof, but in my opinion it would be just as effective. Go ahead and try Bullet Proof yourself if you want though, because everybody responds differently to supplements. What would you recommend for a good night time recovery formula? Probably just a ZMA supplement. People take one bottle of something and expect serious gains…… this stuff stacked with Tribulus taken correctly over the course of 3 months will give you some serious gains that would rival prohormones without all the sides.